I know, I know. You’ve heard the story a million times before. Mean stepmother. Lots of sweeping. Fancy ball. You remember. Or do you? Did you remember that Cinderella was such a nice girl—so smart and funny? You probably would’ve liked her. Did you know that “Cinderella” was just a nickname? And that her handsome prince loved Jell-o and was a wonderful dancer? Readers will delight in following Cinderella through all the usual happenings, presented in a most unusual way. And they’ll finally see what becomes of her after she marries the prince. So maybe you should hear the story one last time. Because it’s actually way different than you might have thought. . . . Kids who have outgrown picture books and are ready for something longer—but still love illustrated texts—will gravitate toward this Cinderella, which was an IRA-CBC Children's Choice selection. 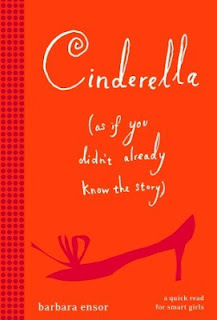 Black-and-white silhouettes of everything from the ugly stepsisters to Cinderella’s slipper (actual size) are intermingled with Cinderella’s letters to her recently deceased mother in this totally original package. And don't miss the companion book to this fairy-tale reboot: Thumbelina, Tiny Runaway Bride. 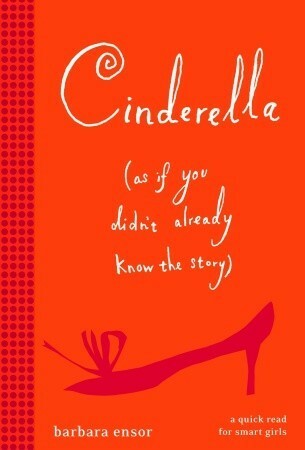 This retelling of the traditional Cinderella story was fun to read. I agree with the cover which calls it “a quick read for smart girls”. I enjoyed the letters to Cinderella’s (dead) mother and the silhouette illustrations that broke up the text. The story doesn’t differ much from the traditional version, although there are some modern elements. What makes it stand out is author’s voice. I’d recommend this as a younger middle grade read, though it’s fun for any age. Because it’s short and illustrated, it would be a good choice for a reluctant reader, too. Barbara Ensor is an author and artist. She created the cut paper illustrations for her story. For more, check out Barbara Ensor’s website. What's So Hard About Writing a Synopsis? One of the hardest things for me to write is a novel synopsis. I find it even harder than query letter, almost harder than writing the entire novel. When I begin, it always seems close to impossible to sum up the main points of a novel in one to two pages. The summary that I wrote up before I began writing the novel doesn't fit anymore, and the scene by scene outline I often keep as I write is too detailed. So now what? Focus on main characters and main plot events. When I get sidetracked by subplots, there's too much information. Too many characters just makes it confusing. Pretend to tell a friend. If I write about the story as though I'm explaining it to a friend in a letter (or even a critique buddy), it comes more naturally than if I try work from scene summaries. Once I have something down, I can go back later to make sure the events are ordered correctly. Include a sprinkling of unique details. Not too many, because the point of a synopsis is to show the plot of the story. But a key detail here and there adds some flavour that makes it easier to read than an boring list of events. I think that's what makes writing the synopsis so challenging. In its essence, it is a list of events. But it needs to be written to highlight and emphasize what's important about those events, using as few words as possible while still capturing the story momentum. Do you have any good tips for writing a synopsis? 1) Over at MiG Writers, my writing buddies have been cooking up something really cool. Next week is agent week!!!! We're hosting interviews with four agents that rep middle grade and YA, asking them some tough questions about the market, misconceptions, and what they are looking for in submissions and in their clients. For more, check out Meet Our Agents over at MiG Writers. 2) Earlier this week, D'Arcy Pattison of Fiction Notes posted about the Top 20 Agents for Middle Grade Fiction, based on self-reported statistics at Publisher's Marketplace. Although this information must be considered carefully (not all sales are reported on Publisher's Marketplace, for example), it may give you an idea of which agents are selling middle grade fiction to publishers. While visiting her father in hospital, 13-year-old Isla meets Harry, the first boy to understand her and her love of the outdoors. But Harry is ill, and as his health fails, Isla is determined to help him in the only way she knows how. Together they watch a lone swan struggling to fly on the lake outside Harry’s window. Isla believes that if she can help the damaged swan, somehow she can help Harry. And in doing so, she embarks upon a breathtakingly magical journey of her own. This is a lovely story of family and friendship. Isla has a special tradition of watching the whooping swan migration with her father. But this year, everything goes wrong. The swans are disturbed by a new power plant and one becomes separated from its flock. Then Isla’s father has a heart attack. While visiting him in the hospital, Isla meets a boy her age, Harry, a cancer patient waiting for a bone marrow transplant. Isla and Harry watch the lone swan from the window of Harry’s hospital room, and together they plan to reunite the swan with its flock. I got very wrapped up in the story with Isla and her worries. I loved the details about Isla’s unusual art project and her uncertain relationship with her gruff grandfather. As a writer, I would read this story again to study how the author created such rich and defined characters that all have realistic emotions and reactions. Lucy Christopher begins her first draft thinking about the characters and emotions. Later, she thinks about the themes. 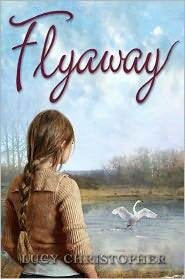 According to the FAQ on her blog, the idea for flyaway came from “the images of birds and migration merging in my head with thoughts about long-term illness”. For more, check out Lucy Christopher’s website. Lately I’ve been thinking about stories I read as a child that influenced my writing and my life. One that really sticks in my mind is A Summer to Die by Lois Lowry. Something about this story intrigued me and I read it many times. Maybe it was because it was the first time I read a story with a character that died. Or because the main character had a sister and I didn’t (I have brothers). Or because the story includes a description of the birth of a baby, something that was relatively new to me at the age of 11. There was a lot in this thin book, including lovely writing. The characters really came alive for me when I read this story, no matter how many times I read it. Kids today might find the pace too slow or the writing too detailed. But I loved details the author included – the painted eggs, the names of the plants (nature again), the photography (not digital, of course), the quilt made of the girls’ baby clothes. [This makes me think of the quote I posted from Molly O’Neill on memorable details in writing middle grade books.] The details in A Summer to Die definitely made an impression on me. Those details helped to build and carry so much of the emotion of the story. 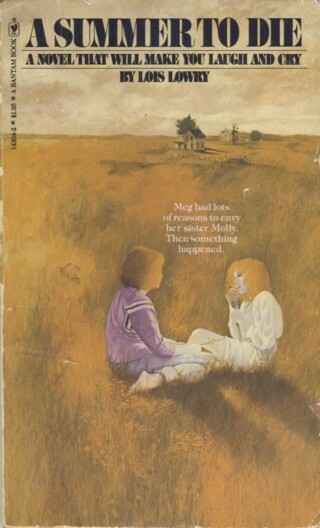 An interesting side note: It was not until I was an adult that I learned that this book was a fictional account of Lois Lowry’s own life and the death of her sister. And it was her first book. Are there any books from your childhood that introduced you to something you’d never experienced or thought about before? Do you still remember details from books you read as a child? I don't usually post on Thursdays, but I thought you might want to know about these free Kindle books, available during a Give A Child a Kindle Book promotion. There are also two bonus books in multiple e-book formats. The books include YA, middle grade and picture books so there's something for every age group. Molly O'Neill: "A lot of time, it’s the details that make a story memorable. In fact, it’s often those same specific details that we remember, months or years after reading a book, rather than the plot itself." Also, do you know about this contest for writers of middle grade? Children's Writer is having a Middle-Grade Mystery Writing Contest. Write a fictional mystery that will engage readers 9 to 12, in no more than 900 words. There is a fee of $15 if you're not a subscriber (but then you get to be one for 11 months -- that's good value) and the deadline is April 30, 2012. Those charged with protecting the king's children are all suspect, and the siblings must choose their allies wisely. But who can be trusted so far from their father's watchful eye and unchallenged authority? 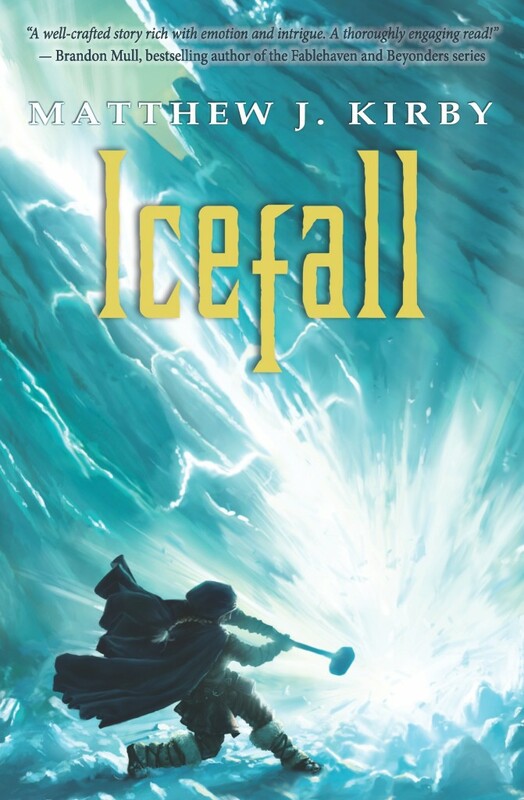 Can Solveig and her siblings survive the long winter months and expose the traitor before he succeeds in destroying a king, his empire, and his children? 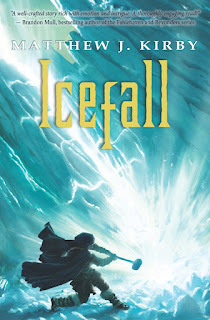 It was great to read a middle grade novel with a setting and mythology (Norse) that I hadn’t come across many times before. I loved the idea that Solveig, the daughter of a king, hides her identity and discovers that she has the talent to be a skald, or storyteller. She also is trying to solve a mystery: which one of her family’s protectors is a traitor? One thing that might put readers off is the slowish pace, but there’s a gradual build of tension in the story and it’s worth sticking with it. The characters seem so real that I got very caught up in what was happening. As a writer, I’d read this story again and again to absorb the lovely way the author uses words to create atmosphere and tension. Matthew J. Kirby is an author and school psychologist. He will be writing Book 5 of the Infinity Ring series, an alternate-history time travel series for readers ages 8-12 written by multiple authors (similar to the The 39 Clues). For more, check out Matthew J. Kirby’s blog. Is Friday the 13th an unlucky day? I'm not one for superstition, but I think that it can add an interesting element in a novel, especially if you're writing for middle graders. Kids can be less skeptical than adults and more willing to believe that something can bring them good luck (or bad luck). They also might test out a superstition to see if it's true. I love it when story characters have their own, personal superstitions that are unique to them. I suspect there are likely some superstitions or sayings that are specific to particular regions or settings. As I'm thinking about these, I'm remembering my grandmother and some of her sayings, which have passed along to me through my mother. I'm also starting to hear the voice of a highly superstitious story character in my head! Have you ever created a story character with any superstitions about what is lucky or unlucky? Or have you come across any stories where superstition plays an important role? Sometimes reading faces is a lot harder than reading books. In this stand-alone sequel to The Mealworm Diaries, Aaron is anxiously waiting for his father to return for the first time since Aaron's mother's death eight years earlier. Aaron works hard with a counselor at school, but he still has problems getting along with and understanding other kids, and he's worried that his dad will think he's weird. As well as having to confront Tufan, the class bully, Aaron must find ways to cope with the fact that his dad now has a pregnant wife and his beloved Gran needs surgery. In the end, his greatest strength is not his intelligence or his sense of humor, but the openness and warmth of his heart. It isn’t specifically stated in the story, but from the clues about Aaron’s thoughts and behaviour, he seems to have some kind of Autism Spectrum Disorder. The author presents a realistic picture of how Aaron tries to cope and understand bullying, friendship and family relationships. I read this book straight through without stopping, because the writing is smooth and easy to read and the story was compelling. The author’s portrayal of Aaron’s feelings and thoughts clearly showed his different perspective on the story events as well as his personality. Anna Kerz is a storyteller from Toronto. This book has been nominated for the 2012 SYRCA Diamond Willow Award and has been distinguished as one of the Ontario Library Association’s Best Bets for 201, named as a Canadian Children’s Book Centre Best Book and as a Notable Book for the Global Society Book Awards 2012. This book is nominated for the Ontario Library Association’s Forest of Reading in the Silver Birch (Fiction) category for 2012. I’ve profiled the other nominated books: The McGillicuddy Book of Personal Records, Crossing to Freedom, Ghosts of the Titantic, Neil Flambe and the Aztec Abduction, That Boy Red, The Glory Wind, Ghost Messages, Milo: Sticky Notes and Brain Freeze and Undergrounders. For more, check out Anna Kerz’s website. The writing is beautiful. It makes me wish I could write so well. But beyond that, it makes me think about books I’ve read in my life and how my favourite books are always there with me. I’ve posted about one of them over at MiG Writers today. Recently I got some exciting packages in the mail. One was from the Middle Grade Mafioso, Michael Gettel-Gilmartin, with a copy of the middle grade novel, Second Fiddle by Rosanne Parry. I can hardly wait to read this! I was delighted to find out I'd won Michael's contest. His blog is a great resource for reviews of good middle grade books as well as bits and pieces of interest to middle grade writers. My second surprise package was a cool mystery box from Elisa Ludwig, author of the YA novel, Pretty Crooked, courtesy of Sleuths, Spies and Alibis. I was thrilled to find out I'd won their contest. Sleuths, Spies and Alibis is a great resource for writers of children's and YA mysteries. They feature books, as well as lots of writing tips and exercises for writers. My teenaged daughter mentioned how much fun it is to get a package in the mail, because waiting for it is part of the excitement. Even though kids are used to the instant communcation we have these days, I know both of of my kids appreciate finding things addressed to them in the mailbox - magazines, packages, even cards and letters. There's something about the thrill of opening that package, a special surprise just for them! Have you ever included a mystery package or letter in one of your novels? I'm thinking I should! MILO is the funny and poignant story, told through text and cartoons, of a 13-year-old boy’s struggle to come to terms with the loss that hit the reset button on his life. Loveable geek Milo Cruikshank finds reasons for frustration at every turn, like people who carve Halloween pumpkins way too soon (the pumpkins just rot and get lopsided) or the fact that the girl of his dreams, Summer, barely acknowledges his existence while next-door neighbor Hilary won't leave him alone. The truth is – ever since Milo's mother died nothing has gone right. Now, instead of the kitchen being full of music, his whole house has been filled with Fog. Nothing’s the same. Not his Dad. Not his sister. And definitely not him. In love with the girl he sneezed on the first day of school and best pals with Marshall, the “One Eyed Jack” of friends, Milo copes with being the new kid (again) as he struggles to survive a school year that is filled with reminders of what his life “used to be." Even though it seems like humour and grief don’t mix, both are part of this quirky but touching story. Milo has a lot to deal with—starting a new school, trying to make friends, trying to get the attention of the girl he likes, and adjusting to life after losing his mother to brain cancer. The author’s cartoon illustrations help to tell the story and also keep it funny, even though the overall theme of dealing with grief is sad. The first person point of view made it easy for me to connect with the character of Milo and I quickly got wrapped up in his problems. Even though the main character is a boy, I think girls would enjoy this book too. As a writer, I’d study this novel to see how to weave in specific details that help to create the perspective of a middle grade reader (e.g. “her smile is like a curly French fry”, “hoping the conversation can be rewound like a DVD”). Alan Silberberg is a children's TV/film writer who lives with his family in Montreal, Canada. Milo: Sticky Notes and Brain Freeze is his second novel. It is the winner of the Sid Fleischman Humour Award. This book is nominated for the Ontario Library Association’s Forest of Reading in the Silver Birch (Fiction) category for 2012. I’ve profiled some of the other nominated books: The McGillicuddy Book of Personal Records, Crossing to Freedom, Ghosts of the Titantic, Neil Flambe and the Aztec Abduction, That Boy Red, The Glory Wind, Ghost Messages, and Undergrounders. For more, check out Alan Silberberg’s website.